Fire in Northern Israel: Israel’s Katrina? The news out of Israel is just heartbreaking. We in post-Katrina America know a thing or two about a how a country can spend obscene amounts of resources on weapons of war while its basic home front preparations are left to languish. I well remember how back in 2005, even while the causalities in NOLA mounted, painful readiness issues were being publicly debated. Eli Yishai is the Interior Minister. Yesterday, when PM Netanyahu did the right thing and showed up at the emergency command center in Haifa, Yishai was nowhere to be found. Earlier, he tried to spin the story, blaming the finance ministry for the budget cuts. Israel could buy three state-of-the-art Bombardier Superscooper firefighting planes for the price of just one of the F-35 stealth fighters it has on order. The highly specialized amphibious aircraft, costing $28.5 million each, can scoop and drop six tones of water up to 10 times per hour on a fire that is near a big body of water. 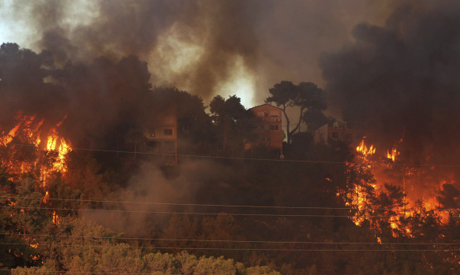 The Israeli blaze is only a few km (miles) from the sea. But Israel does not have any. Instead it has to rely on Mediterranean neighbors who also face a constant wildfire risk and were prudent enough to buy the water-bomber aircraft. Greece has 21 of them, Croatia 6. Israel instead has chosen to “improvise,” critics said. On Thursday night, airforce mobile water cannon designed to operate on flat tarmac could be seen trundling warily into position on steep earthen slopes, their range still quite inadequate. By contrast, Israel has 360 F-16 fighters, far more than most countries outside the United States that have bought the world’s best-selling attack plane, not to mention many F-15s and the whole panoply of costly, advanced military aviation. Under such circumstances, it is best for Israel not to embark on war against Iran, which will involve thousands of missiles being fired on the home front. After the Second Lebanon War, which exposed how pathetic the civil defense system was, reports were written, exercises were held, but everything broke down under the stress of a real emergency on the Carmel range − an area that already experienced the trauma of Hezbollah missiles. Yesterday Israel asked for help from Cyprus and Greece, and the air force traveled to France to bring fire retardants to make up for the material that had run out. In war time, it is doubtful whether Israel will be able to rely on the generosity and largess of its neighbors. We can expect more recrimination and accounting in the days to come. In the meantime, however, I know our hearts and prayers are with all whose lives have been torn by this horrible tragedy that, as of this writing, continues to rage on. This entry was posted in Current Events, Hurricane Katrina, Israel on December 3, 2010 by Rabbi Brant Rosen. It blatantly demonstrates the severe lack of comprehensive preparation on the part of the military to deal with real disaster. And to think, the US could have given Israel 120 firefighting aircraft in lieu of the 40 F-35s they’re about to receive. Sort of on the flip side, I wonder what the real potential for diplomatic progress is if Syria and/or Lebanon would be willing to offer assistance. It seems to me like quite the opportunity, and there is still time for them to act as the air here in Haifa still smells like smoke. Pipe dream, I’m sure, no (bad) pun intended. Er, hurricanes in the Gulf of Mexico are a regular occurence. Forest fires in Israel, not so much.